Open Leadership — That’s The Way It’s Supposed to Be! We kicked off our inaugural Clearvale SecondFloor (CSF) Seminar Series last week, featuring Charlene Li and her new book “Open Leadership” (see Giovanni’s blog for some addtional insight). It was truly refreshing to be 70-270 chatting with someone as insightful about ESN as Charlene. I’d like to thank those who attended (over 120 of you!) and provide the transcript below (inlcuding both my “Jay Leno” monologue and Q&A) for those who missed it. 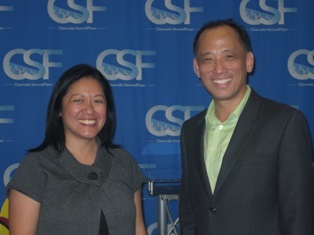 The event video will soon be posted on the CSF network — please register to become a member there. implies both Consumer 2.0 and Enterprise 2.0. To say that there has been an explosion in Consumer 2.0 would be an understatement. Take, for example, Sina’s own microblog, the Chinese version of Twitter. Launched less than 12 months ago, it’s already exceeded 20 million registered users. But the more impressive thing is its growth — adding more than 200,000 new users per day. At that rate, it would double itself every 100 days. Both California’s gubernatorial candidates — Jerry Brown and Meg Whitman — are hoping that Facebook will soon file its IPO AFTER the November Election, so that the State’s financial crisis can be solved by its employee stock option exercises in one fell swoop, much like Google’s IPO did for the State back in 2004. Talking about Facebook, it is blocked in China, not because of the country’s strict content censorship or national security concerns, as is commonly believed, but because, in my opinion at least, that even without any meaningful participation from China, it’s already exceeded 500 million registered users last month. Can you imagine had it had Chinese participation, it would have surpassed the 1.3 billion magic number and become the world’s most populous nation almost overnight — and that, obviously, would not bode very well for the Chinese psychic or its national pride. And if that were to happen, President Hu Jintao would have to invite Mark Zuckerberg to become a Politbureau Standing Committee member of the CCP. Our kids now exchange Facebook contacts — no more email addresses — because to them, email is too one-dimensional, too 1.0; it’s passé, old school, and not very cool. The entire freshman class at Stanford, according to Sociology Professor BJ Fogg, arrived last year already connected on Facebook. Most classes now use Facebook in more than one way — students are effectively learning as much from each other as they do from teachers. If you don’t recognize that all this new Consumer 2.0 stuff is causing a sea change in every aspect of our lives, you’ve been living in a cave somewhere. Of course, our focus for the Clearvale SecondFloor (CSF) Seminar Series is Enterprise 2.0. I don’t know about you. But I find it ironic that as professional workers we seem to be more connected with our high school classmates over Facebook, with whom we now share very little in common, than we do with our own colleagues and customers, who, after all, are the people helping us getting our work done and, ultimately, our bills paid. I recently heard a frustrated F500 CHO (Chief HR Officer) complaining that she had to go to LinkedIn to find out her own employees’ competences and what they’re thinking about, as opposed to via a more private and secure internal social network. Many of us believe a social platform can and should be adopted by the enterprise, which can stimulate the same profound sea change in every aspect of our business in a world that’s gone flat and virtual, requiring us to be more flexible, agile, and innovative in order to compete and succeed. Enterprise 1.0 is one-to-many — it’s a linear function of N. Enterprise 2.0, in contrast, is many-to-many —hence a geometric function of N2. Clearly, N2 is much more powerful than N.
Much like “stock option” is for our people to have an ownership stake in the company, Enterprise 2.0 is about a new “speak option”, empowering all our constituencies (management, employees, partners, customers, even the public) to have a voice, so as to fully participate and collaborate with each other to facilitate better decision making, faster problem solving, etc. In the final analysis, the critical success factor here boils down to a corporate culture of openness, as it’s masterfully explained in Charlene’s new book — “Open Leadership”. So it is with tremendous pleasure that we kickoff today’s CSF inaugural event with a “fireside chat” with the inspiring author herself. Let us welcome our guest today. Charlene, could you come to the podium, please. Before we get started – “Charlene Li.” Tell us a bit about yourself and your Chinese American background, especially since we’ve got a big online audience for this program in China who’d be very interested in that. Many of our online audiences viewing this video are overseas where enterprise social networking (ESN) or so-called “enterprise 2.0” remains a very unfamiliar concept. Could you first help us define what it means for social media in general and enterprise social networking in particular? For years, you worked as a senior analyst at Forrester. How did you become an analyst and when and how you turned your interest to social media? What was enterprise social networking like when you first started studying the phenomenon? How far have we come? In your new book, you identify the inevitable loss of control as perhaps the biggest issues that executives are facing today. Why is that? Is that the biggest fear that executives have about opening up and going “social”, whether internally or externally? I found one of the more interesting passages of your book is where you run the reader through an “openness audit,” and you then observe, “now that you know how open you are, let’s look at how open you need to be.” What do you mean by that? In fact, being open doesn’t mean you’re inviting anarchy. So you boarded an aircraft carrier in action — the USS Nimitz — that must have been quite an experience! As you mentioned in your book, the US Navy encourages very open communication amongst the rank and file, but when it comes to running the ship, they maintain supreme order and discipline. Do you see that as a model for social networking would work for enterprises? Please tell us more. It’s a little-known truism in the business world that social media is not at least as much about the rules, as it is about the tools (the technology). And if there is any one challenge for businesses trying out social media, it’s “adoption” – designing and nurturing the social media program so that it works. Let’s spend a few minutes looking at the rules. One thing you ask your readers to do is to establish “covenants” with their various constituencies. Can you remind us why you use the word “covenant” and not “contract,” and can you give us some real-world examples of how such covenants have helped businesses? Another really interesting section of your book looks at how smart organizations design their social media programs by first analyzing workflows. You have this great chart illustrating how the US Air Force handles blog comments. In your opinion, how well are businesses designing around workflows, and do you see any innovation here. In other words, how does the 2.0 type of semi-structured or unstructured processes mash with the much more procedural and structured 1.0 workflow? Until recently, if you uttered the phrase “social media” to a CEO, he or she would have thought you are talking about external use cases that leverage consumer social media such Facebook or LinkedIn. How much are businesses today embracing the internal use of social media, and what exactly are they doing? In addition to a Social Intranet, there is the Social Extranet/Internet, or Social CRM in short — applying a social platform to customer engagement and self-service. You mentioned a number of examples in your book in this area as well, such as someone’s painful experience with United Airlines. Could you elaborate a bit more why it’s important for companies to be more proactive in social CRM? Let’s talk briefly about the “M” word – measurement. There’s a great quote in your book, attributed to John Hayes, the CMO of American Express. He says, “We tend to overvalue the things we can measure, and undervalue the things we cannot.” That is SO true. Still, there is no way for an ambitious social media program to get sold within an enterprise WITHOUT a fair notion of how success will be measured. What are some of the best practices here? Perhaps the most inspiring part of your book – at least for me – was the final chapter, where you look at specific leaders – real people in high places – that shook of the shackles of control, and helped guide their organizations through massive transformations. We’re talking about organizations like Best Buy, Cisco, P&G, the State Bank of India, and the US Department of State. Can you pick on of these and tell us what was so special about what they did, and how social media helped them do it? Many enterprises worldwide are now intrigued by 2.0 and ESN, partly due to an unbelievable consumer phenomenon called Facebook. CEOs are all wondering: what does this all means to me as a business. As a summary for our program today, what’s your advice for them if they are still not sure whether adopting a more open management style by empowering all their constituents to engage and collaborate via social networking is a good idea? Thank you so much, Charlene. I learned so much from you today, gaining a lot more insight beyond what I’ve read from the book. How about another round of applause for Charlene? Now let’s open up for your questions.